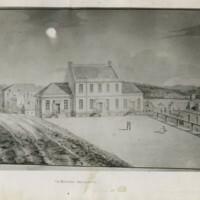 Item is a photograph of the first Dalhousie College building, located on Barrington Street. 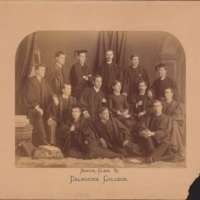 Item is a photograph of the Dalhousie College senior class of 1885. 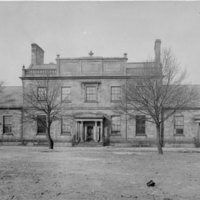 The photograph includes Margaret FLorence Newcombe, the first female graduate of Dalhousie College. The photograph shows class members sitting, standing, or reclining in three rows.